The second of the set could work for me if I didnt know of the shot in visible light. Its hard to imagine the assigned colors in the last two. Now do we have any idea what colors the insect might experience? How would we reach that knowledge? Is there a concention is assigning insect vision colors or is it representative of some scientific method? Well, the sensitivities of their eyes have been researched for quite some time, also the neuronal processing they do in their optical systems in their brains (there are various theories though), but what they actually "see", we cannot imagine. What I have done is map their sensitivities and subsequently my images (which were done using matching filters) into out human color space, hence why I call it "simulated" bee/butterfly vision as no-one can really know. 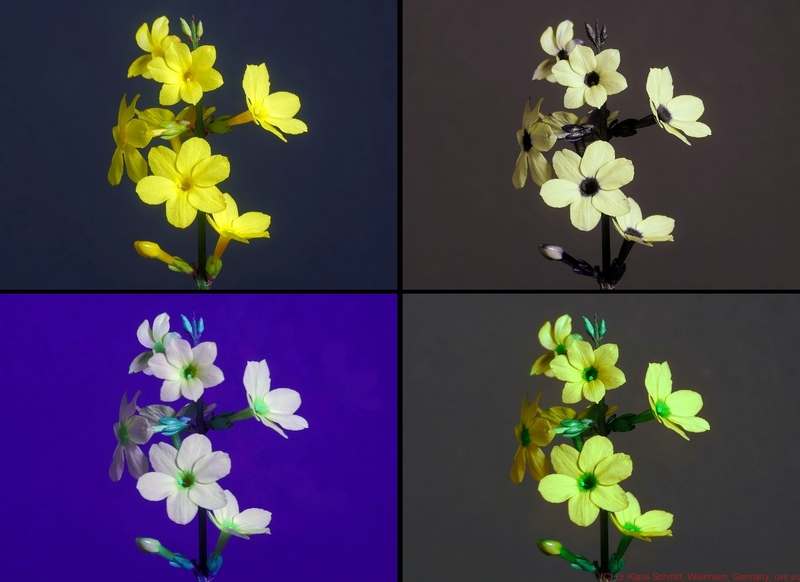 Is there any reason why you cannot make a new convention in which the resultant colors are mapped only into color spaces where the landed color would show as being beatifully complementary or fitting with the other colors of the flower in the wavelengths of light chosen to view flower. That would result in logical combinations which would always appear beautiful to us!